This is re-posted from my old blog. When I was in the throes of my pie crust research last year, one of my most significant stumbling blocks was sorting out how to replicate medieval flours using what I could get in a modern world. I lamented greatly that I could not simply walk down to the store and buy some bolted stone-ground flour made entirely from heirloom “landraces” of grain. 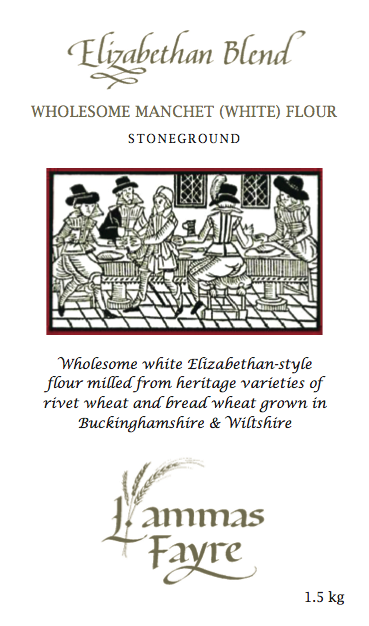 Lammas Fayre flour by John Letts at Heritage Harvest is a very special range of heritage and ancient English organic flours available online exclusively from BakeryBits. I might have literally cried a little with excitement when I read that (I get emotional about ancestral foodways sometimes! don’t judge!) then, naturally, I ordered a whole bunch of flours to play with. Bakery Bits (the UK company that is the exclusive source for Lammas Fayre flour) has been a delight to work with, and shipping, while understandably expensive, was also fast and relatively painless. I’ve made pies using two of the blends I ordered (expect a full report on that in the next week or so, once I can get pictures uploaded). I’m planning to finally get back to my artisan medieval bread experiments, too, although that may have to wait until the summer. 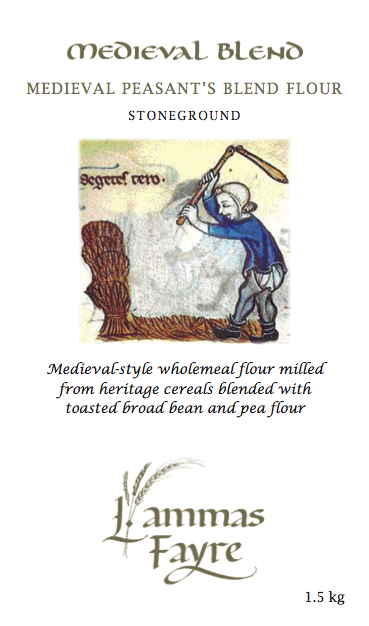 I thought other medieval cooks interested in using these flours may find it helpful to have a guide as to which of these flours will work for which applications, and how they align with what we know about available grains and flour in high medieval England (which is my personal specialty — I’m hoping others can round out this guide for other time periods). Here are my thoughts on four of the Lammas Fayre products, with links to my past research. A mix of wheat, rye, barley, oats, broad beans, and peas. This is a wholemeal flour, meaning it has not been bolted/sieved. Mixed grain flours were typically made from grains grown together in the field, such as maslin (see below), dredge (barley and oats), or bulmong (see above), so this mix would appear to be made from a mix of all three of these common mixed crops. The Lammas Fayre peasant blend is in line with general trends in peasant grain consumption, as you can see above. If you are recreating bread produced for servants, eaten by peasants, or the least expensive bread available from professional medieval bakers, this is a perfect option. I would not use this to recreate recipes out of extant medieval culinary manuscripts, as those are all from high-status contexts. I made a long-fermented sourdough loaf from this flour mix, and the result was heavy, but delicious and very filling. I would posit that, for most of the population, maslin was a staple food. I’d be curious if Letts / Lammas Fayre has research to support the sieving of maslin, as that is not something I have ever seen reference too; in all of my research, the only type of flour to undergo bolting was pure wheat flour in high-status contexts. If you are willing to let that slide, this is an excellent choice for recreating the food of commoners, such as bread or pie crusts; again, I would not use maslin to recreate high-status food. If I dive back into my street food research and make some plausibly historical “medieval fast food” pies, I will use this flour. I made some sourdough bread from this mix as well. It was slightly lighter weight than the horsebread loaf, but still dense and hearty. My somewhat picky wife liked the flavor better than the horsebread. My total inability to find any rivet wheat at all last year made me the saddest baker, so finding this particular product made me go a little wild with glee. Fun fact: the citation in there should indicate why I was so excited to find these flours; the Letts I cite is the same John Letts behind Lammas Fayre. I suppose citing his work to validate the authenticity of his flour is kind of circular, but I view his extensive research as evidence that this guy really, really knows his stuff. But I find myself in a bind here: Letts’s own findings seemed to suggest that bread wheat and rivet wheat were grown and presumably used together, but this blend contains exclusively rivet wheat. 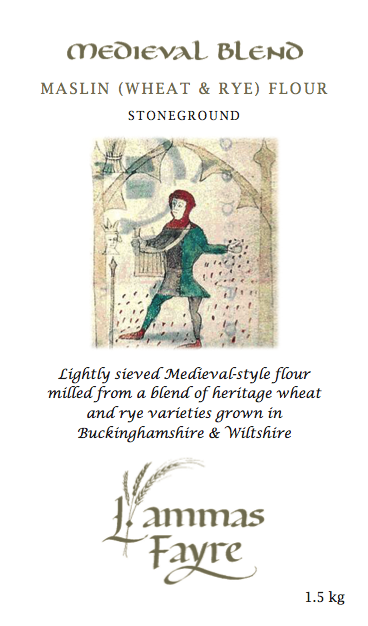 I think to recreate medieval wheat flour, it would be more appropriate to use a blend of both rivet and bread wheat flours; so if you are going for very strict authenticity, this may not actually cut it on its own. I have absolutely no regrets in purchasing this flour and I plan to use it as a “novelty” more than anything; I think there’s some rivet wheat sourdough in my near future! Although billed as Elizabethan, I actually think this is the best choice in flour if you want to recreate high-status medieval English baked goods. It contains a mix of bread and rivet wheat flours, and it has been stone ground and sieved (bolted) to remove the bran and yield a “white” flour. This is exactly the type of flour that my research supports for both bread (see my notes on wastel bread specifically in my bread research) and pie crusts. If you want to make a fritter recipe out of Forme of Cury (and don’t we all! ), this manchet blend is perfect. 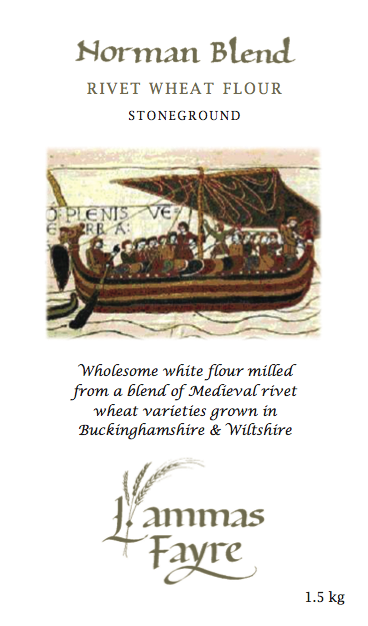 Basically, if I could only have one Lammas Fayre flour for medieval cooking, this is what I would pick. I know a couple of other people who have purchased flours from Lammas Fayre, mostly in pursuit of bread making. If you have played around with these flours and have further recommendations for recreating historical foods using these products, please leave a comment or a link! I am now completely excited to meet you and talk with you about this at WCCS next, and entirely jealous of my wife, who is actually taking your class on this topic.